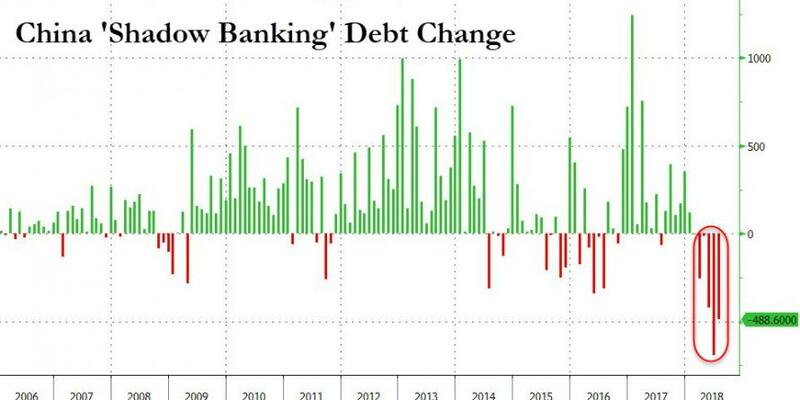 With China having given up on its latest attempt to deleverage in response to the escalating trade war, the market was keenly looking at the latest credit metrics out of China to see if this was already reflected in the official data, and sure enough July new RMB loans and M2 data beat market expectations largely thanks to the recent burst in new loan issuance. While July TSF was slightly below market expectations, this was due to the ongoing shrinkage in shadow credit while sequential growth of TSF rebounded from the low level in June, and will likely continue to expand as the government maintains its easing bias in coming months. New RMB loans: Rmb 1450BN in July (RMB loans to the real economy: Rmb 1290bn) vs. consensus: Rmb 1250BN. Outstanding RMB loan growth: 13.2% yoy in July vs June 12.7% yoy. Total social financing: Rmb 1040BN in July vs. consensus: Rmb 1100BN and a modest decline June: Rmb 1392BN. However, issuance of local government bonds in July was Rmb 652BN, compared with Rmb 391BN issuance in June, according to WIND data. 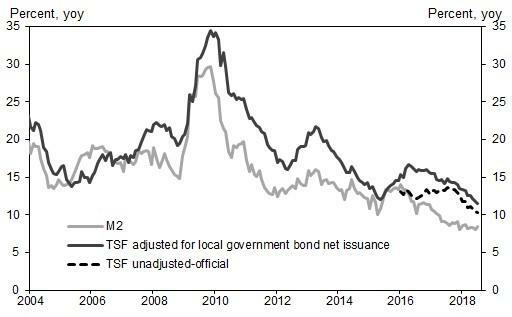 After including this local government bond net issuance, Goldman estimates adjusted TSF stock growth at 11.5% yoy in July, lower than June. The implied month-on-month growth of adjusted TSF was 17% SA ann, higher than 5.9% in June. The implied month-on-month growth of adjusted TSF was 17% on an annualized seasonally adjusted basis, higher than 5.9% in June. One note: the PBOC adjusted its methodology of TSF starting this month by adding loan write-off (outstanding amount RMB 2.4 trillion as of July 2018) and depository institutions' asset-backed securities (outstanding amount RMB 855bn as of July 2018). 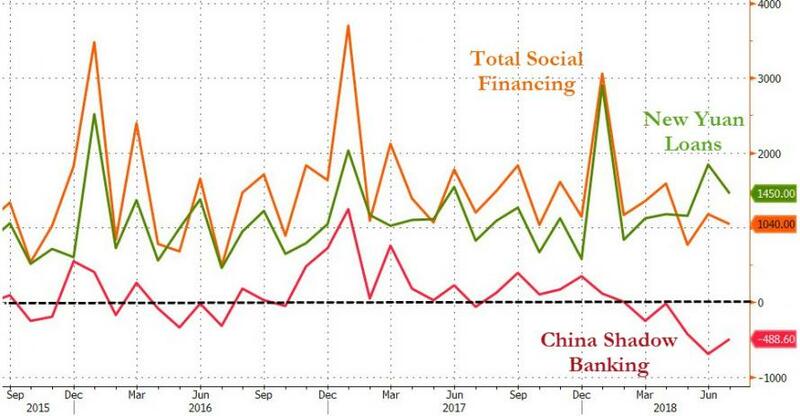 As in recent months, the reason why TSF was below new RMB loans was entirely due to the ongoing decline in "shadow banking" conduits, such as entrust loans, trust loans and bank acceptance bills. M2: 8.5% yoy in July, higher than the consensus: 8.2% yoy. and up from the record low M2 print of 8.0% hit in June. As noted above, on total social financing growth showed a sequential rebound in July, after adjusting for seasonality. Meanwhile, the amount of RMB loans was particularly large. And while shadow banking products under TSF such as entrust loans, trust loans and bank acceptance bills continued to contract, the pace of contraction moderated from June, consistent with the policy goals of the government. 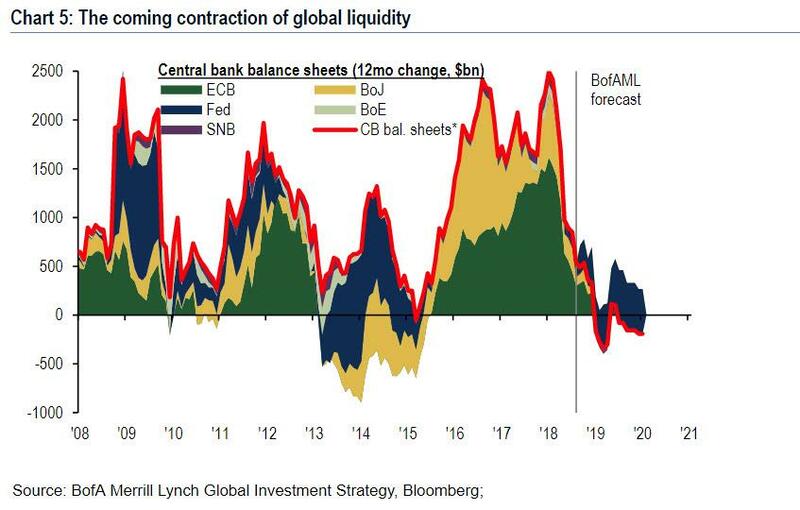 As Goldman notes, the government stepped up the magnitude of the loosening in July, and became more blunt and hands-on; the bank expects the government to maintain this loosening bias in the coming months as the trade tensions linger. Meanwhile, the rebound in M2 growth from an all time low should alleviate pressures on the PBOC and CBIRC and likely ease market concerns about the ability of these government ministries to loosen policy effectively. In terms of factors affecting money growth, the FX position was probably largely stable in July. M2 growth accelerated despite the negative contribution from fiscal deposit changes. MOF data indicated on-budget fiscal expenditure growth was slow at 3.3% yoy while revenue growth was faster at 6.1%. The loosening of fiscal policy has been mainly in the areas of faster off-budget bond issuance and borrowing of local government platforms. Clearly in a world of growing EM default/repudiation and lower EM growth, China will have to pull the monetary levers even more dramatically if it is to reflate the world. China’s move looks increasingly like it has come too late to take the world smoothly to the much higher inflation that is necessary to reduce the world’s excessive debt burdens. For a time at least, repudiation and not inflation will dominate the outlook for investors, particularly those in emerging markets. 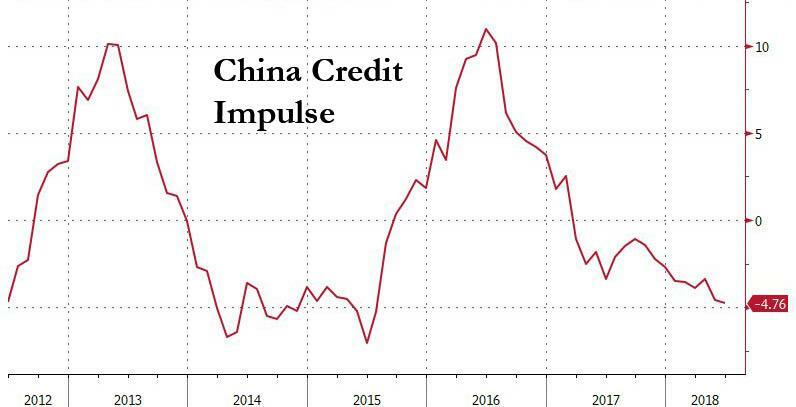 And despite the latest stronger than expected China credit data, China still has a long way to go to: the latest data showed that China's credit impulse is still negative and remains at the lowest level it has been in two years.